As a developer and some-time designer, I’m always on the lookout for tools to make communicating with customers easier. For many things, the textual tools that web workers reach for are sufficient: email, wikis, project management systems, instant messages, and so on. But sometimes you just need to draw a picture to get your point across. The latest tool I’ve run across for this is Balsamiq Mockups – and it’s a nice tool indeed. When you run the desktop version, you get an empty window that looks like a notebook page (complete with spiral binding) and a menu bar of controls – everything from web browser shells to progress bars to charts to maps to all sorts of widgets. To construct a user interface mockup, you drag from the menu bar to the drawing area, then click and drag and resize things. Widgets that contain data – like a table or a textbox – make it easy to edit that data, so customizing the user interface for the application you’re showing off is trivial. The drawing style is deliberately sloppy: rough lines, semi-handwritten text, even the ability to add scratch-out lines over part of an interface that you want to cross out. This is actually just what I want for a prototyping tool: something that can’t possibly be mistaken for working software, but that’s good enough to discuss design decisions and application flow. Balsamiq Mockups is built using Adobe AIR as its engine, so you can try it on the web or download it to run on your desktop on Windows, OS X, or Linux. There are also enterprisey online versions for Confluence, JIRA, and XWiki. The desktop version is free to try, but it lacks some essential features (like saving, exporting, and flipping through multiple mockups in a single session). Registering it will cost you $79, which on a big design project could be money well spent. Peldi is awesome! We have been using Balsamiq for many weeks now and it has helped us a lot. We have discovered some issues early-on when prototyping our screens and it has saved us a ton of time! To dror: this tool is best meant to be an offline tool, not an online service. I am not sure what services you want from it that you can’t get from its current “product” form? I ran into this before and liked it, but would want to see it as a service rather than as a product. Mockups is bitchin’. Pure and simple. It’s rare to find a tool that both devs and non-devs enjoy using, and use productively together. Huge fan! I’ve started using Balsamiq 3 months ago. We use it internally to sketch out UI ideas. It’s faster than pen & paper and gets the job done quickly. Peldi is very active in his support forums so you can expect a top-notch service. I’m a fan. We use Balsamiq Mockups when hashing out ideas with clients. 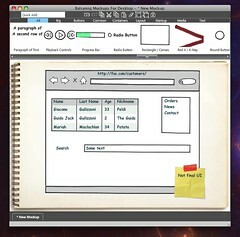 We can huddle around the Mac or put it up on a screen, and roughly determine what the app will look like. It’s especially good because clients don’t expect us to create an app directly from the mockups. That, and we can create them in record time.